Remember when The Industry Standard and Business 2.0 and Fast Company were the biggest magazines in history and then in the space of a few months they weren't and in the case of The Standard it ceased to exist all together. This postseems to suggest that the same might be hapenning again, with the so called "new economy" business titles losing ground in ad sales to the general business titles. I doubt if this is a bubble bursting, it probably just means that web based business stories are mainstream. The Industry Standard founder, John Battelle used to argue that one day the new economy would be the economy and his magazine was the chronicler of that. He was half right. As Business Week puts a Blog story on it's cover for the first time the world of the web is indeed connverged with the world of business - it's just that The Standard didn't survive to see it. Arable Farming Auto Trade Beauty Counter Builders Merchants Journal Building Design Cabinet Maker Caribbean Travel News Europe Carpet & Floorcovering Review Catering Chemist & Druggist Community Pharmacy Construnction Weekly Control and Instrumentation CTMS Dairy Farmer Design Engineering DIY Week Electronic Engineering Electronics Times The Engineer Estates Times Euroglass Farming News Financial Pulse Food Manufacture Food Manufacture International Forestry & British Timber Glass Age Glass Interiors Home Furnishings Housewares Housewares Europe Laboratory Equipment Digest Leather Leather in Asia Manufacturing Chemist Metalworking Production Microwave Engineering Europe Music Business International Music Week One to One PATA Travel News Europe Packaging Week Pharmacy Today Pig Farming The Practitioner Premier Beauty Printing World Process Engineering Pro Sound News(Europe) Pulse Studio Sound & Broadcast Engineering Subcon Timber Trades Journal Travel Club Travel Trade Gazette (Europa) Travel Trade Gazette (UK & Ireland) Tunnels and Tunnelling Tyres, Batteries & Exhausts What's new in Building What's new in Computing What's new in Design What's new in Electronics What's new in Electronics Europe What's new in Farming What's new in Industry What's new in Instrumentation What's new in Interiors What's new in Processing Wood Based Panels International World Paper. Thats a 38% survival rate. If in the next 12 years we lose 62% of our business magazines there is not the creative juice or the advertiser market to replace them with new magazines. You read it here first. The number of business magazines published in the UK in the year 2018 will not be 5000, but 1900. Online Marketing or trade shows - You decide? American Business Media, the US trade body for business publishers, conducted some research recently that showed that trade shows were a good thing. The research claimed to show that when buyers went to trade shows to see products and services that they were responisble for buying, they tended to buy or express an interest in buying. To be fair I am simplifying this a little but two things struck me. Why are the only surveys ever published that prove how effective trade media is produced by associations and trade bodies that represent trade media companies? Secondly, even if the research is true it doesn't prove anything. Events where people meet are always going to be an important part of the marketing mix (that's why I would invest in shares in a trade show company, but not in a magazine company) but that does not mean that the return on investment from attending a show is better than substitute marketing solutions. Attending a trade show is hugely expensive. A 9m2 stand will costaround £3000, plus the cost of transportation, staffing, dressing the stand, hotel expenses, travel and lost sales time eleswhere. It is unlikely that even the smallest stand will cost the exhibitor less than £25000 fully weighted. If the average business has a 10% margin, the smallest exhibitor needs to create £250000 of new sales for attending the show to avoid the experience being earnings dilutive! What would £25000 buy you in on line marketing? Paul Woolfenden, one time senior honcho on the Express titles, has spent the last few years bravely trying to battle against the inevitable. Working for Andrew Neil, he has been trying to heave The Business in to viable trading. You'll remember it as the Sunday Business. It briefly sold moderatley well, certainly in the tens of thousands, but now relies on free bulks for all but a tiny part of its circulation. Who needs The Business when the biz sections of the nationals are so comprehensive, when the net offers such choice and immediacy. I suspect the answer is no one. The latest wheeze, I am told, is to convert the paper into a magazine. This strategy at least has the merit of being different from the current one, but otherwise I can't see how it is expected to work. Sales of general business magazines are universally dreadful in the UK. The American edition of Business Week sells poorly here, the Economist sells ten times as many copies abroad as here, where, even with its wide brief, large budgets and editiorial pedigree it manages to grub less than 40000 UK newstrade copies a week. In the middle of the net boom, even the zeitgeist mags about the internet economy barely sold a copy in the UK. There will always be somebody with flare and vision who can break the mould, but if Wollfenden pulls this off I'll buy him the Express as a birthday present. Trinity Mirror's sale of its magazine and exhibition division, Inside Communications for £41m to the management, backed by private equity company Ion is a modest triumph. Revenues for the division last year were £32.7m delivering an EBITDA of around £7m. Press Gazette reports it straight, but what does it mean? Inside Comms is a hotchpotch of trade mags, most notably Inside Housing and consumer titles and shows, much of it about caravans. Trinity Mirror CEO, Sly Bailey resisted the managements desire to buy the business for some time, arguing that although the business had little strategic fit with the rest of the business, it was very profitable and highly cash generative. The price achieved amounts to a 6 multiple, which probable makes it not much more than a neutral deal for Trinity in financial terms, but Sly must have judged that with little prospect of growth (it hasn't grown in some years) she can better put the cash to work on other activities - buying more web businesses for example. For the new owners Inside Comms, now renamed Ocean Media, will be a tough growth challenge. No doubt the management have been sold a buy and build story by their new backers. They may find that daily grind of servicing a leveraged business in practice makes this tough to do. David Moran, the MD is a good operator. There won't be much cost to take out so this is a gamble on some management driven organic growth. A speaker at a BBC magazines conference reported to the assembled delegates that the number of Magazines in South Korea had fallen by 65% in eight years. It was argued that the driver of this dramatic decline was technology and the Internet. I am not sure if South Korea can be seen as a bellwether for the rest of the publishing world, but it might be. 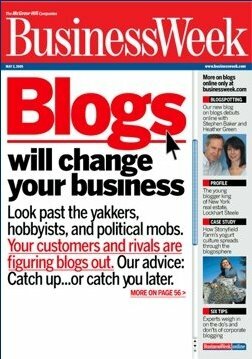 Think about this thought, if business magazines still devote around 40% of their content to "news" and that news is available 24/7 on the web, what is the point of the magazine? This may be death of business magazines by a thousand cuts. Recruitment has largely gone to the web, news has gone, display advertising is moving at an ever faster rate into roi measurable internet search solutions. The cuts are getting deeper, blood is beginning to pour. So what must business media publishers do? The first task, and its a big one, is to stand up every morning and say to themeselves and their people, "Our magazine business as we know it is dying and unless we change the way in which we think we are doomed to bankruptcy." Not many will do this for fear of scaring the shareholders and the staff. But, as they say, you can't deal with your alchohol problem until you admit you have a problem. This is a big subject but here are five issues that recovering business magazine publishers should be addressing. 1) If business magazines are not for publishing news, what are they for? 2) How can business pubilshers fully integrate the digital and off line products to create a single branded information solution? 3) What will the economics of business publishing look like in a post news magazine world? 4) Who are the real competitors that business publishers should be worried about in the digital world. 5) How quickly can business publishers adapt the offline products to make them relevant and useful in an online world. To be fair, the main problems for Emap are in its consumer divisions and the management claim that business media products are still showing growth. Actually what management actually says is that apart from the areas where business is declining faster than expected, they are enjoying growth. As I have reported before, the public sector recruitment revenues on which EMAP have historically relied for a substantial proportion of its b2b profits have collapsed. What is clear is that what affects consumer media today will affect business media tomorrow. Steps have already been taken by Emap with the acqusition of Worth to move its future into the digital age. Expect to see Emap as an aggressive bidder in future acutions of business to business digital assets. Associated Newspapers have made a small but highly significant series of acquisitions. A 2.8 multiple of revenue implies strong future profitability, but all three of these businesses should have been in the eyesights of business media players. If newspaper groups are accumulating vertical job boards (inretail and a jobsboard for tv production folk in this case) then the premium that will need to paid by aspiring business media companies with strategies to buy themselves into the future will get larger. Centaur finds new CEO was there all along! Centaur spends two years looking for a CEO to replace 70 year old Graham Sherren (pictured) and comply with Higgs, and then appoints the bloke who sits next to him! There is nothing wrong with this of course, except that in practice it almost certainly means that nothing very much changes. The new CEO is Geoff Wilmott. and he is an excellent executive. Nevertheless he is the bag carrier for Sherren and will probably exert no more influence on the direction of the business than he has done in the past as the CFO. Shareholders have missed a golden opportunity. However, the pre close trading results are at first sight impressive and have pushed the share price up 3% in early trading. The management claim a double digit revenue growth. It will be interesting to see how much of this is from acquisitions and how much from organic growth - especially when the pre close statement brags about growth in internet recruitment. When the full numbers are published we will have a detailed look at them and report wheher they are a barometer for the future of business media. Does management censor copy at TES? about the cuts annoucned last week (see my earlier post). Curiously the article is now deleted from the TES website AND from the Google cache. What did it say that was so offensive to TES management we are wondering? Or is it just a problem with the google cache and the TES site? Which is most likely? What surprised me most about Barbers comments was that I had thought this was how the FT worked anyway. The FT was an early pioneer of web editions and it seems extraordinary that only now have they realised that they must organise their editorial in a platform neutral way. None the less there are some good ideas in the plans Barber has announced. He will be merging the company reporting desks from online and the newspaper and then plans to have all copy prepared with hyperlilnks embedded in the text by the journalist at the point of production. The reporting in the trades and the national press about this has focussed on the 50 redundancies that arise, but it is the change in work practice which is more significant. What I fear has not been thought through is, that content for the web, indeed any digital content must be written in a different way than content for a newspaper. Similarly if the web is going to break all your news stories then the role of the hard copy paper must change too. There may be no reason why a companion website to a magazine or newspaper should undermine readership of the paper product, but the editorial strategy of almost every magazine and newspaper I have seen appears designed to guarantee that outcome. An integrated newsroom requires integrated publishing thinking and although this is a useful step by the FT which may show the way for others, there is a long path yet to tread. The tipping point for b2b online advertising? The latest statistics from the Advertising Association make grim reading for traditional publishers. In the year to March 2006, advertising spend on business and professional magazines fell in real terms by 1.4%. IN 2001, not a good year for business magazines as they struggled to recover from the bursting of the dotcom bubble and the consequent collapse in technology advertising, the value of display advertsing in business magazines was £684m. On a moving annual total basis its just £627m today. Classified advertsing is even worse falling from £518m in 2001 to just £434m today. For classified advertising read, recruitment advertising. Let's think about what that means. In five years we destroyed a company twice the size of Centaur Media, or about the size of RBI's magazine business. That's not good. The AA don't seperate their statistics for internet advertising between business and consumer. It's about time they did. However, we do know from their survey that the total value of internet advertising in the last twelve months was more than £1.5b, up 60% on a year ago. Are we approaching what Malcolm Gladwell calls the tipping point? Are business media companies moving fast enough to adapt to this new world? The answer is no, but there is still time - just. Phew! Digital is "no threat" to paper based media. online content as a threat to print. This is roughly equivalent to asking a flock of turkeys at Christmas whether they think a growth in ham eating is going to save their neck this year. Some hope. Asking users of information how the impact of digital information is affecting their off line reading habits might be illuminating but this isn't. Which executive in a publicly quoted publishing company is going to tell a researcher that his business model is dying on its feet? If online content is not a threat to print why are newspaper sales in decline? Why are classified markets in regional newspapers evaporating faster than the contents of a birdbath on a hot Summers day? Why is online advertsing expected to exceed that of newspapers or magaazines within the next twelve months? Why is Google the biggest media company on the planet and not an offline publisher. Wake up Chicken Lickin', the sky really is falling in! move seamlessly between the mainstream and the niche. He is talking about a concept he calls the "long tail" where the democracy of the net makes a publisher out of anybody and nobodys. His thesis is used in the article to postulate on the impact on television, music and the film industry. But what of the impact on business media? It seems pretty clear that the days of the dominant business trade weekly are over. Who needs to read their trade weekly when so much more information is available now, right now, on the screen in front of you? Go and check the paid circulation decline of trade magazines over the last few years. Their are no examples, at least none I can find, of any trade magazine with a significant paid sale throught the newstrade, increasing its sale in the last five years. None! Subscriptions are declining at a slower rate and more patchily because of inertia. But in newstrade sales, where readers must make a determined effort to buy their magazine the pattern is plain. As the web develops there are increasing volumes of specialist places to go for business to business information. What is the fastest growing tech site in the US. CMPnet? IDGnet? Cnet? No, it's tomshardware. Its about motherboards, niche, specialist and awesome. Also, how many blogs are there in the UK on specialist business to business themes? I shall try and find out, but I am sure that there are more today than then there were yesterday. The implication of all this is that there is a lengthening tail of activity in the b2b sector and this has important implications for b2b media companies. In days of yore new products were launched at trade shows and promoted through advertising and PR in trade mags. In days of yore music releases were launched on Top of the Pops, promoted through advertsing in Melody Maker and elsewhere. Today, well, think Arctic Monkeys. In business to business watch suppliers begin to by pass traditional media in business to business as they follow their audience into the long tail of web based b2b information. PPA keeps Web at a Distance. Like King Canute trying to hold back the tide, the PPA's mission statement seems not to have noticed that the water is already lapping around the ankles of business publishers. Although there is a subtle aknowledgement that business publishers are in media rather than only magazines the tasks undertaken by the PPA in it's 2005 objetives (what happened to 2006?) make no mention of the web at all. If the PPA is to remain relevant and not dwindle into being a small special interest trade association of little relevance to its members it is going to have to stop being focussed primarily on what it rather quaintly calls, periodicals. United Business Media's acquisition this week of Commonwealth Business Media marks an important watershed in the tenue of David Levin as CEO. It's his first sizable acquisition and can therefore be seen as a signal of future intent. This is an entirely new market for UBM and is an indicator that the management see digital competence as more important than market synergy. That seems the right approach to me providing the management think about what the learning is from their new business, and how it might be applied in other parts of their business. All senior management teams love doing a deal, but the real work is the post acquisition integration. Never has that work been more important than it is today in a world where new media models need to replace old. UBM paid a handsome 2.7 revenue mutliple for this business but a modest 12 x EBITDA. UBM can be relied on to pay 12 muliples in most of their transactions. With EMAP already started on a series of buys in the digital business media space, and other business media companies in the mid market needing to, UBM may soon find the competition for assets hotting up. Reuters Chief Tells It As It Is. "...quite a few of the old media companies will fail because their readers or viewers don't view them as relevant any longer." The supposed top digital publishing brands have been announced. I am not sure how Amazon counts as digital publishing. It's in the digital retailing business isn't it? Anyway, it made me think about what the top business media publishing brands were. Mmm. It's not easy. In days of yore we would have found it easy to name the top business magazine brands, and we would probably have all readily agreed with what they were, but there is insufficent of real quality in business media digital publishing to be able to do that yet in the new world. Sounds like an opporunity to me. Leave any suggestions for top business media digital brands in the comments below. Does a digital copy count? Reports that the ABC is planning to allow business magazine publishers to count requested digital copies as part of their average circulation will do nothing to protect the offline industry from the new digital world. In truth this plan, supported by the PPA and it's members ,will further confuse the business media circualtion currency and in the long run alienate advertisers. We do not know whether readers of digital editions are as effective viewers of display advertsing as readers of print magazines. What we can be sure of is that their behaviour will be different. So imagine being a media buyer and trying to decide a schedule where you have two candidate magazines; one of these magazines has a cirulation of 10000 all print, and one has a ciruclation of 11ooo with 8000 print and 3000 digital copies. Under the latest ABC proposal both will have the same average circualtion. But which is really best? ABC is supposed to help advertisers by providing a currency which enables them to discriminate between titles. It says as much on it's home page This latest proposal is a further weakening of the value of the currency. EMAP s business division has made an interesting series of acquisitions of digital businesses. It seems to have decided that it cannot migrate elegantly from old to new so it is going to buy its way into a future. The latest deal is valued at $24m with a further $5m deferred against future performance. This acquisition of AME Info, the leading business information site in the region, gives EMAP a powerful digital play to support its MEED business based in Dubai. Multiples have not been released but given the pace of growth in Dubai and Emaps publishing presence there, you can expect it to have been high. Astonishingly the RNS release claims that AME Info boasts 750000 unique users. That means EMAP have paid some $32 for every user! Buying into the new world is never going to be cheap. This deal also illustrates again that rich lumbering publishing companies are struggling to innovate their way out of the death of business magazines. Trade weekly for journalists, Press Gazette has recently announced a tie in with the Press Association where regional newspaper publishers can run job ads for free in the pages of the magazine. Press Gazette will earn its money (although I guess not much) from sponsorhip of the section by PA.
Press Gazette probably considers it has nothing to lose as most if its job advertsing has long since disappeared to the regional newspaper backed Hold the Front Page. It is risky though. What happens when PA decide they no longer want to sponsor the section? Won't other fully paying advertsers object to "free" advertisers dipping into the reponse pool? How will this strategy lead to revenue growth for Press Gazette. I am drawn to the conclusion that this is either desperate or very clever and I am not sure which. The biggest flaw in the thinking is that it doesn't tackle the basic probelm of competing with cheap on line alternatives - they work! Is this further evidence of the terminal demise of magazine revenue streams or is it an example of a clever defensive strategy for an off line solution in an online world? Hands up! Yes, I thought that was the answer. The UK business media market is very fragmented. As traditional revenues come under increasing pressure the need to amortise overhead will become ever more pressing. For some small to medium sized players this will become urgent soon. It is expected that Findlay, the specialist engineering and manufacturing publisher in Kent will be put up for sale in the next year or so. Faversham House, the small niche publisher in Croydon was touted around the market last year, but there were no takers. Incisive Media has grown through a series of acquisitions but now finds its share price stalled and revene growth expectations hard to measure up to. Centaur has just about delivered against its float promise, but increasingly liooks like a chaotic mush of smallish positions in too many dull markets. United has no discernibale strategy. Least ways none that can be made out from UBM CEO David Levin's speech to the PPA recently. (I may write a critique of this speech. I found it shocking). Reed Business Information has growth in it's jobs board business and has some interesting search intitiatives, but must be questionining the value of its core magazine and trade show businesses which look decreasingly strategic and high growth. Emap is suffering from the fall in its public sector advertising which has hurt its local government and health publishing. My prediction is that within two years all these businesses and more, will be reporting year on year revenue declines in double digit percentages. Bulk up now, or shrivel and die. The Guardian reports this morning that the TES will be increasing its rates by 10% when it relaunches in the Autumn. This is the right and only strategy for the paper to take. It has private equity owners who will be demanding a 25% compound return on their investment. The TES already enjoys a dominant market share of the available recruitment advertising so there is little prospect of volume growth. Cost cuts have already been announced, so price increases are the inevitable only further strategy. What TES customers will have to come to terms with is that feeding a private equity owner means that growth must continue every year. These price increases that are speculated in The Guardian will not be the last. The risk for the management of the TES is that the DES gets fed up with lining the pockets of businesses with its recrutment dollar and decides to provide an alternative itself. Ask Derek Carter at EMAP how that affects your recruitment revenues. Equally, with no alternative but to push up the price, isn't this the time for a new low cost on line competitor to eat the TES lunch?